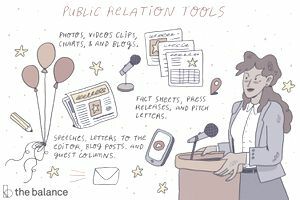 Public relations efforts (often called initiatives or campaigns) are communications activities that enhance visibility, shape public perception and affect change. These activities create a positive public image for businesses, non-profit organizations, and individuals from rock stars to religious leaders. Public relations (or PR for short) is considered earned media and differs from marketing which you have to pay for. There is a lot of truth to the old joke that public relations is "the care and feeding of reporters." That's because the essence of public relations is to inform (and persuade) the public using media like newspapers, magazines, television, and radio or social media via the web. Whatever media is used, the PR professional needs to convince them that the person or organization they represent has a good story to tell, or a good product to share, with the journalist's readers. Some people (such as elected leaders, professional athletes, actors, and rock stars) don't need to reach out to the media. They need a PR pro to handle the daily crush of media requests. But it doesn't matter if you're proactive, reactive, large or small. everyone uses the same tools to get their message out. As a publicist, you (and your client) have to "earn" the respect of the media in order to gain press exposure. Marketing and advertising professionals, on the other hand, are tasked with getting people to buy something, typically with advertising campaigns. Advertising campaigns result in media exposure in say, The New York Times which always runs ads from fashion designer Ralph Lauren. These ads are expensive. But a profile piece about the head of men's ready-to-wear at Ralph Lauren costs nothing. In order to inform people, create fact sheets, press releases, and pitch letters. You can also hold press conferences and town hall meetings. To persuade and inspire people, write speeches, letters to the editor, blog posts, and guest columns in local and national newspapers. You can also book appearances on local and national radio and TV talk shows. Conduct a multimedia campaign using accumulated photos, video clips, charts, and blogs. You can also use social media platforms such as Facebook, Twitter, and Instagram to get your message out in short form. The role of a public relations professional is to inform people about a product, a mission, an issue, an event, or a person. Public relations actually has a lot in common with journalism in addition to the writing aspect. It's the publicist's job to initiate the story and the journalist's job to convey the story, to the public. In essence, the journalist is the "conduit" through which the publicist speaks to the public. If you've never done this sort of thing before, it might seem scary to contact the editor of the newspaper or to give a speech in front of the Chamber of Commerce. But with a little self-confidence, anyone can learn how to do this, and many PR pros are self-taught. All it takes is time, effort, and a passion for telling a story.